Acupuncture is an oriental medical treatment which has been practiced for hundreds of years that is based upon the flow of energy through pathways in the body called Meridians. Acupuncture treatment was provided with the use of tiny needles to stimulate the nerve centers in the body. Today’s acupuncture needles are sterile, disposable and almost as thin as a human hair. Modern healthcare has also introduced needle-less acupuncture, acupuncture magnets, and electro stimulation which additionally has been proven to be extremely effective. One of the unique properties of acupuncture points discovered by scientists is that acupuncture points are more electrically conductive than the surrounding tissue. This led Yoshio Nakatani, MD, PhD to develop the “Ryodoraku” method of examining the meridian system of the body through electronic measurements. The collection of this data and assimilation is represented in the graphic charting called Electro-Meridian Imaging or EMI. This process has made acupuncture diagnosis much more accurate and comprehensible. Through the use of a specialized electronic device, the electrical sensitivity of specific acupuncture points can be measured. 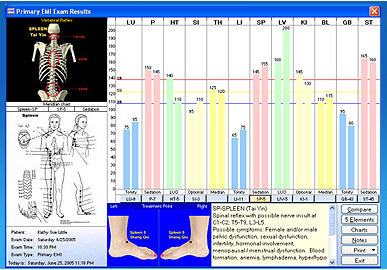 This information is uploaded to computerized software that produces a graphic representation of the energy flow throughout 24 primary acupuncture meridian points. From this graph, information about the functioning of the major organ systems of the body and the individual’s overall health can be derived. These imbalances in the meridians are strong indicators of existing conditions and/or developing health problems. The EMI has been able to revolutionize the way acupuncture is being practiced by providing another option besides ancient pulse diagnosis. This contemporary, digitally electronic system allows the patient to receive a copy of their graphic interpretation, as well as diagnostic criteria. The patient will be able to better understand their particular needs and Dr. Steiner will help create an individualized treatment plan for enhanced healing & health. The major benefit of EMI and acupuncture treatment is in identifying underlying factors affecting chronic conditions such as depression, fatigue, headaches, digestive problems, fibromyalgia, and hormone imbalances. By balancing the electro-magnetic energy in the meridians, the underlying cause of many conditions can be treated. The EMI is a valuable tool in achieving and maintaining the balance of acupuncture point meridians thereby helping enhance overall health and wellness. These findings are described as tendencies” since they are not meant to diagnose disease or replace diagnostic testings such as EKG’s, MRI’s, or blood tests.